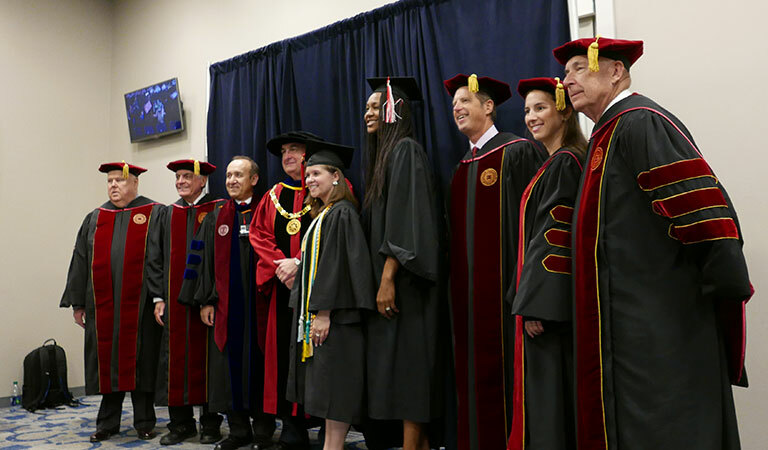 Chair of the IU Board of Trustees James T. Morris, IU Trustee Michael J. Mirro, IUPUI Chancellor Nasser H. Paydar, IU President Michael A. McRobbie, student speaker Amber Kriech, Commencement speaker Tamika Catchings, and IU Trustees Andrew F. Mohr, Anna M. Williams, and Philip N. Eskew Jr. share a moment prior to the 2017 IUPUI Commencement (l-r). 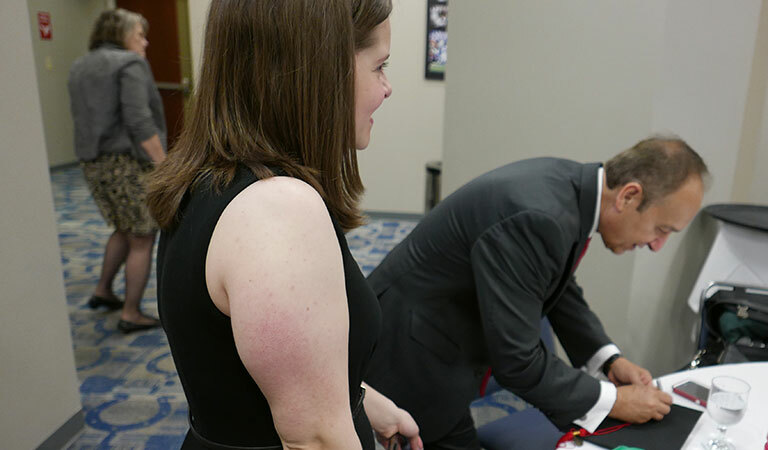 Chancellor Paydar is the first to sign student speaker Amanda Kriech's mortar board! A tremendous honor. 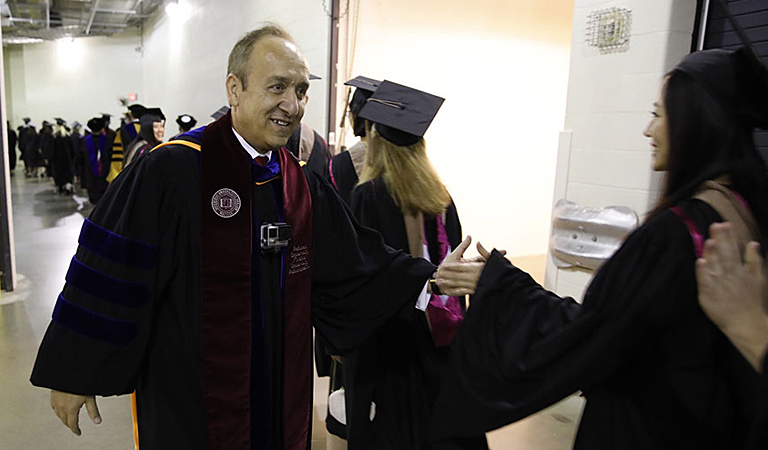 IUPUI Chancellor Paydar greets graduates on their way to the 2017 IUPUI Commencement ceremony. 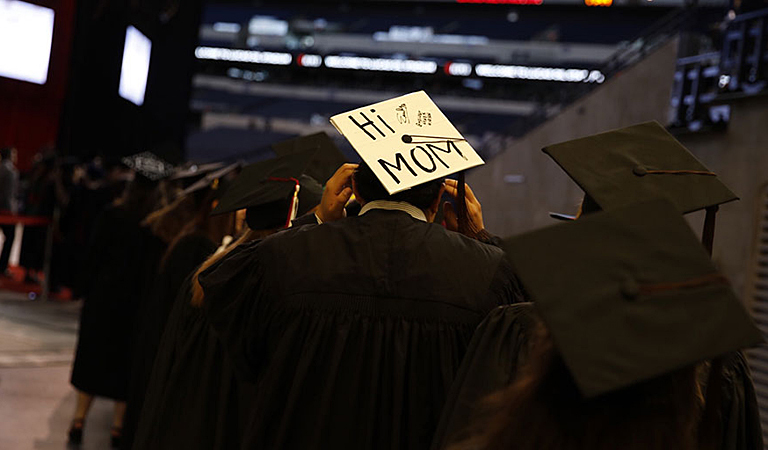 Graduates give shout outs to moms on Mother's Day at the 2017 IUPUI Commencement. 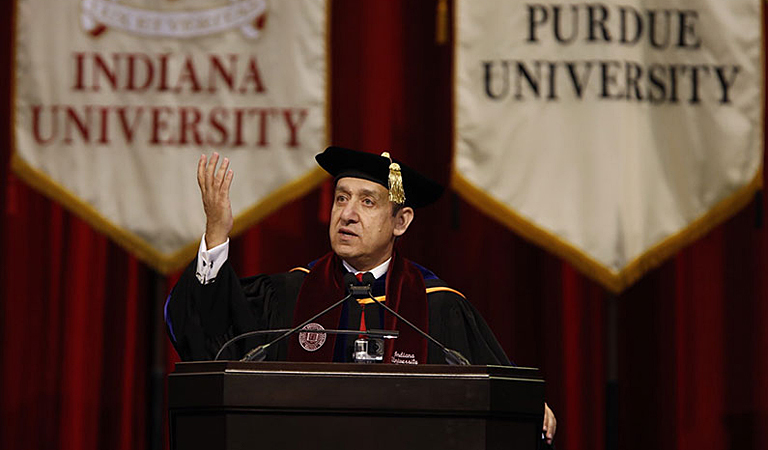 IUPUI Chancellor Paydar emphasizes the need for the free flow of talent from around the world in his remarks at the 2017 IUPUI Commencement. 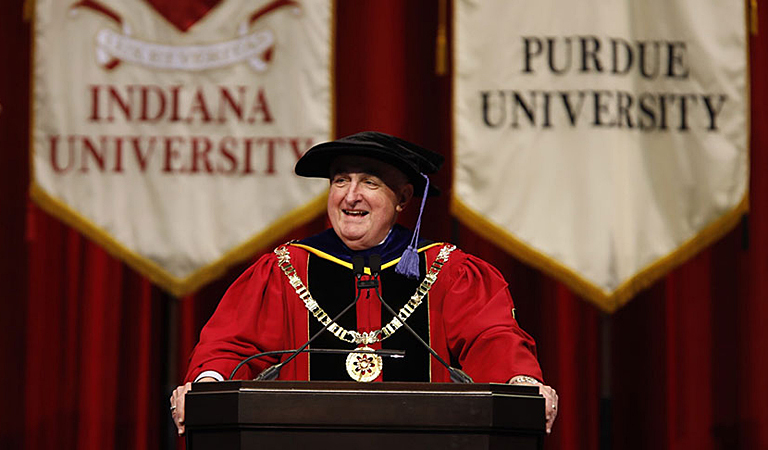 IU President Michael A. McRobbie speaks about truth at the 2017 IUPUI Commencement. 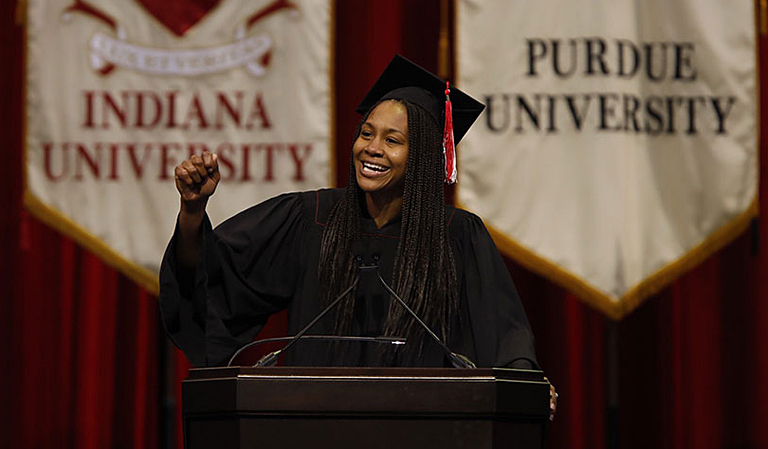 Olympian and WNBA superstar Tamika Catchings shares her inspirational story in her address at the 2017 IUPUI Commencement. Tamika Catchings exclaims, "Welcome to the Team!" 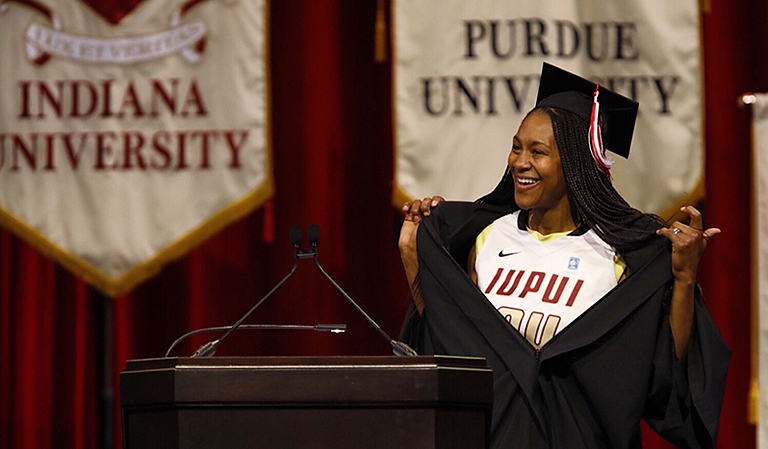 as she surprises graduates, family, and friends by sporting her IUPUI Jaguars jersey at the 2017 IUPUI Commencement. Now that's Jaguar Spirit! 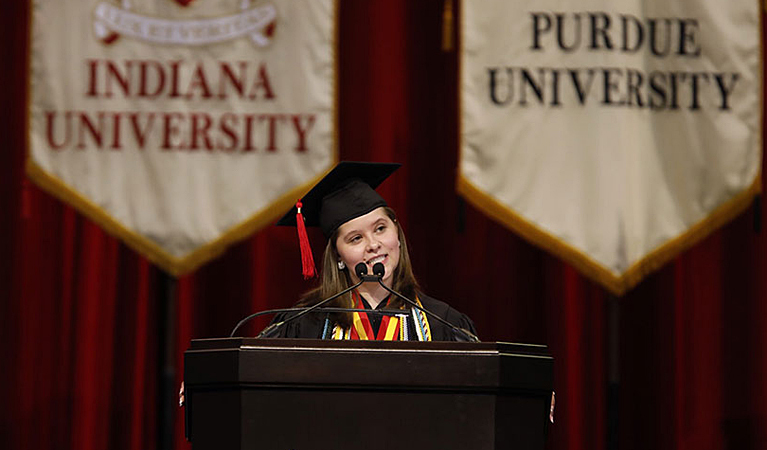 IUPUI graduate Amber Kriech from the School of Engineering and Technology speaks at the IUPUI 2017 Commencement. 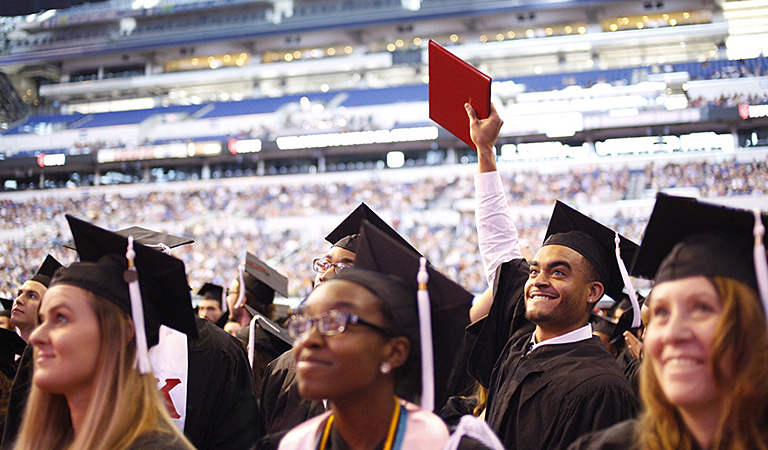 Pure excitement for one IUPUI graduate at 2017 IUPUI Commencement. 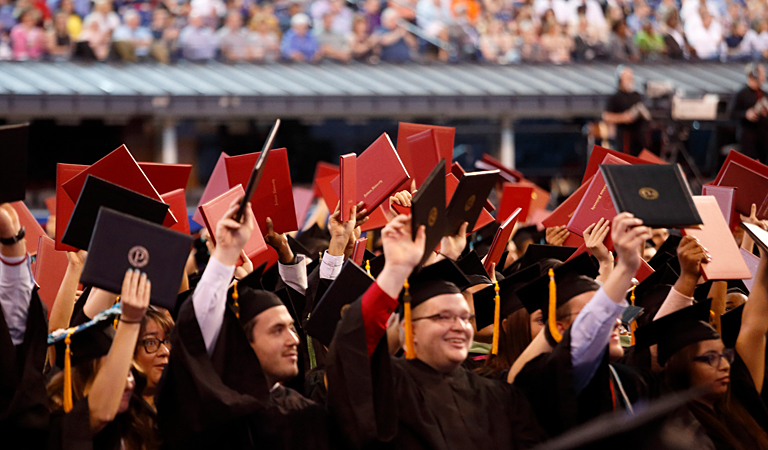 Graduates hold their Purdue and IU degrees high, while over 10,000 friends and family applaud at the 2017 IUPUI Commencement.